Bob Janssen on the newly installed track sign 1999. Nelson Provincial Museum, Nelson Mail Collection. For over 10 years Nelsonian Bob Janssen went the extra mile in his work for the Nelson City Council and took on a project to transform the blackberry and gorse-covered hillside flanking Princes Drive into a green, bush-clad park. Bob was a mobile gardener for the Council. He moved around the city maintaining small pockets of wasteland, often upgrading them into roadside plantings to improve attractiveness and deter the dumping of waste. One of Bob’s patches was maintaining the grassy road verges of Princes Drive. But Bob wanted to do more. He asked his boss if he could plant along the roadside. That was all the permission Bob needed. From 1990 to 2000, he slowly and surely extended that planting down the hillside. It was no easy task. The dry slopes were covered mostly in 4metre high “old man” gorse. 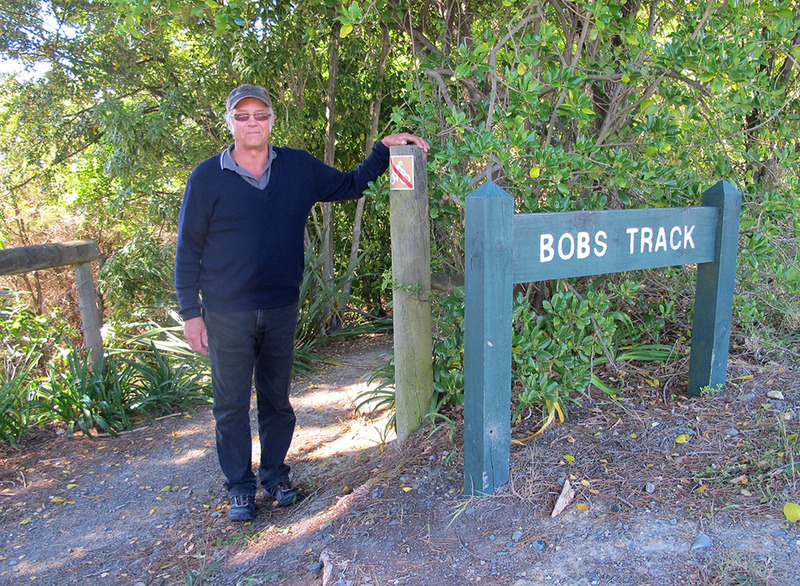 Bob’s technique was to laboriously cut access tracks, allow the felled gorse to rot and slowly introduce native plant species such as manuka, cabbage tree, ngaio, mahoe and beech. Once these pioneering species were growing, Bob planted an understorey of trees such as rimu, miro, matai and titoki, and ground cover like astelia, flax and renga renga. Local residents, once they saw what Bob was up to, were right behind him, offering plants and physical help and praise. Many friendships were formed. 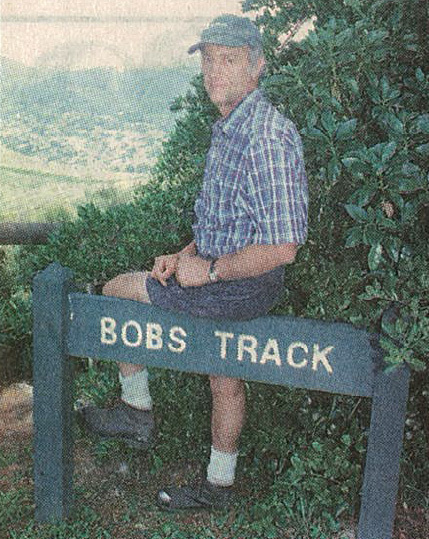 Community identification with the hillside project became so strong that, when the Council proposed subdividing parts of the land in the mid 1990s, locals formed a committee to oppose development and initiated the naming of the track in Bob’s honour. The Nelson City Council now cares for the hillside. Planting days with Nelson school pupils are held on neighbouring slopes. In 2014 a cycle track to link Princes Drive with Emano Street was started. 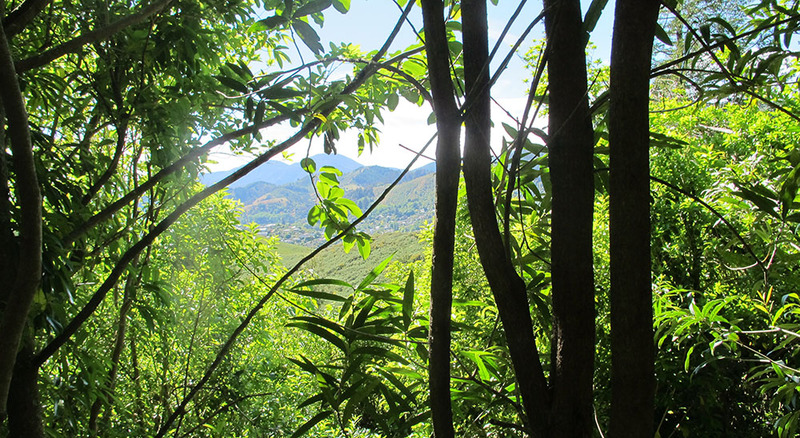 In addition to the hundreds of trees and shrubs Bob established on the hillside, he planted 50-60 kauri. Kauri are Bob’s favourite tree, an interest connected to a family block of land in the Coromandel where Bob and his siblings established a grove of what are now tall giants. Many of the kauri on Bob’s Track are well established. In future they will protrude through the canopy and tower above Toi Toi Valley, a fitting tribute to Bob Janssen.